The TICK series has been discontinued. Please see the CA71 model as a possible alternative or contact our Temperature Engineering department. 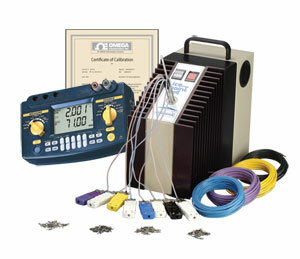 TICK Series Thermocouple Instrumentation Calibration Kits are complete laboratory calibration kits for any type of thermocouple instrumentation. Each kit comes complete with an ice point ™ reference cell, a precision 6 1/2 digit multimeter, dc mV source standard, thermocouple reference probe assemblies, thermocouple lead wire and copper jumper jack. Used in calibration or metrology laboratories, the TICK Series is ideally suited to provide a practical solution to your calibration needs of thermocouple instrumentation. Offering a total system accuracy of less than ±1.0°C over all thermocouple type ranges, the TICK Series is the only instrumentation calibration standard needed. The TRCIII ice point ™ reference point cell relies on an equilibrium of ice and distilled, de-ionized water at atmospheric pressure to maintain six reference wells at precisely 0°C. The wells extend into a sealed cylindrical chamber containing the distilled, de-ionized water (walls are cooled by thermo-electric elements). The reference wells are maintained at 0°C to within ±0.1°C or better and a stability of ±0.04°C for constant ambient. Supplied with each TICK unit is a set of TRP Temperature Reference Probes for J, K, T and E thermocouples. The TRP Reference Probe locates the thermocouple-copper transition reference junction at the end of an 1/8" diameter sheath for easy insertion into the TRCIII ice point ™ calibration chamber. The CL8500 dc mV source standard offers the highest degree of precision available in a compact self-powered instrument. Standards include alphanumeric displays of output values and messages, display lighting control, value storage and recall functions. Available with either RS-232 or IEEE-488 communication ports, providing for easy re-calibration of the test instrument via remote computer. Accuracy of the CL8501 is 0.005% of reading. Each unit is supplied with a calibration certificate which is traceable to National and International standards by a continuous chain of comparison.